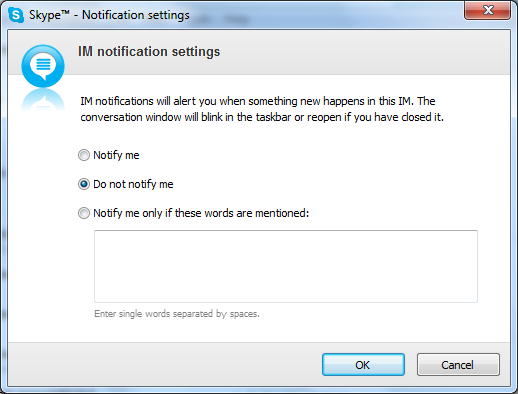 In this trick we will see how to turn off the notifications for receiving an instant (chat) message from a given contact in Skype. 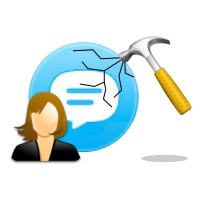 The contact will not be blocked, he will be able to call us or chat with us and we will still receive the messages. The only difference is that we will not be notified in any way (with sound or visually) for the instant messages from this user. You need Skype 4 or newer. Sign in and left click on the contact in your contact list. From the window choose Do not notify me and click OK.
That’s it. You can also choose to be notified only if a given word is mentioned. In that case choose Notify me only if these words are mentioned: and input the word (or words separated with a space). To restore everything back to normal, go through steps 1 to 3, but this time choose Notify me.